Arepa is a typical Colombian dish from the region Antioquia, my home state. 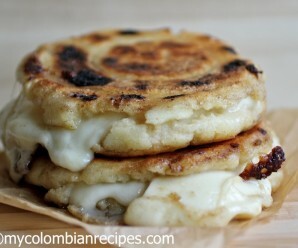 We serve Arepas warm for breakfast, spread with butter and cheese on top, with a good cup of Colombian hot chocolate. These Arepas are an essential part of the Colombian daily diet. You can serve Arepas as a main course or appetizer with any topping you like. Combine the cornmeal, warm water, cheese, 1 tbsp butter and salt, mixing thoroughly. Let mixture stand for five minutes. What do you mean when you say “precooked” cornmeal? Cooked as in like polenta? That’s the only way I could figured to do it. Precooked cornmeal is called masarepa,if you do not find this kind yo can use the one you use for polenta. Erica — Looking forward to getting your help with these the next time my sister visits so I can surprise her with these that she loved so much after her trip to Medellin. Thanks for the offer. In the US, the best ingredient to make the paisa arepas is “White Hominy”. You can get it from Goya foods, but there are also other sources. It is very much like mazamorra. The label on the can also calls it “Mote Blanco” and “Pozole”. It is exactly like the cooked white corn we use for the arepas in Antioquia. It comes in slightly salted water, so I drain it, rinse it, and drain it well before grinding it (on a food processor) to the consistency of the arepa dough. The result is the real thing, perfects arepas. Like you, I am a paisa, married to a gringa. But I am not the cook. She makes the most delicious Colombian foods, and she was thrilled to find your website. Thank you for doing it. Pedro- thank you so much for the wonderful comment. I am going to try mote soon. Masa harina also works fine, as it’s a corn flour that is very similar to masarepa. Thanks for sharing. I’m going to try making arepa at home. We loved eating arepa and calentado when we visited Bogota. Colombia is a beautiful country; can’t wait to go for another visit! Wow, your website was such a find! I was born in Medellin and came to the US with my family when I was very young so I never learned how to cook our traditional dishes. Looking through your blog has brought a smile to my face! My gringo boyfriend and I want to try to make arepas this weekend, and he’s super excited to try some of your other recipes, especially that Colombian pizza! Mmmm! Thank you so much for this website! 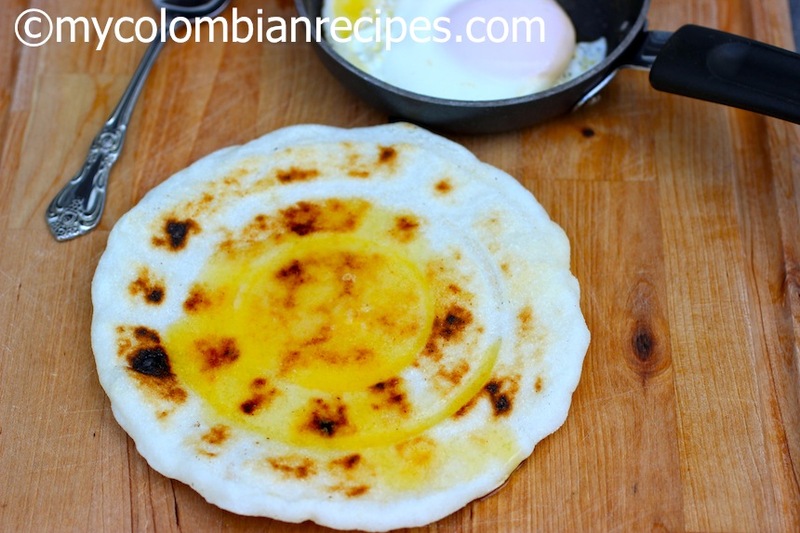 I love cooking Colombian food for my Caleño husband, and these recipes are so authentic and easy to follow! He was delighted with the arepitas we had with dinner tonight! The package directions state 2 cups of areapa flour to 1 cup of water. Is your masa real thin. I see everyone is as excited as I am about your blog. Great way for you to make new friends. You have a new one here in Houston, Tx. I am from Bta and my mother used to cook something that she called ‘entero’. do you have ‘entero’ in Medellin? Marta- What is entero? What kind of dish? Mariel- Every city has different recipes. In Medellin it is popular to marinade the meat for 24 hours with herbs and beer and spread beer with oil when you are grilling the chuzos.Maybe one of my readers can help you. I also made these last weekend as a side dish to the Pollo Asado (found in the Main Dishes section) I made for my sister’s birthday. If I knew how EASY these were to make, I would have made arepas every day for breakfast, Medellín style. I only added a pinch of salt to the dough but that’s just how I like them. I will never, ever ask my mom to make arepas again just so I can satisfy my craving. I can now make them myself! THANKS Erica! I first tried arepas at a Cuban restaurant outside of Orlando and their style served was the Arepas Rellenos de Queso. I love all kinds of grilled cheese and this is no exception. Thanks for your recipe because I’m using it tonight for a Cheese & Corn Arepa stuffed with a Papaya and Habanero Chicken filling. Muchas Gracias! Answer: On the chuzos, they were spreading some sauce over them…it was kind of greenish…I was wondering if you might now what sauce that is and how to make it. I made arepas today for breakfast and I loved them. I just made these for lunch…YUMMY!! This is a great, quick recipe! As everyboby else I am very glad I found your blog. It has become my main cookbook 😉 Half of my family is from La Guajira where they make also a delicious type of arepa a bit smaller than the Paisa arepa but much thicker. It is usually stuffed with different types of fillings. I tried to bake them in the oven because it is much quicker but they turned out too dry. 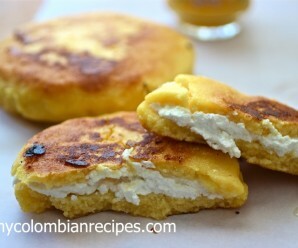 Do you have any recipe for baked arepas? Thank you so much for having this blog! Can you cook these on an arepa pan (the ones with the holes) or do they need to be cooked through in some way first? I am worried they will break up? We use PAM but my Colombian husband cooks them in the oven, they seem a bit hard (delicious but not like they are in Col.!) Do you have a recipe for hogao, can’t see it here. Thanks, great blog! So great to find your recipes! We’ll be experimenting with arepas this weekend. Would you mind emailing us to let us know what kind of cheese you could use instead of the traditional Colombian farmer’s cheese? We’re going to try to find it, but just in case…! I spent my childhood in Santa Marta, and arepas are one of the many, many things I miss desperately… along with the queso campesino/queso costeño that went both in and on them, and which I have not been able to find anywhere else. It’s a relatively hard cheese, kind of rubbery–almost squeaky–and definitely salty. You can cook the areas in a George Foreman grill. Cooks evenly on both sides and butter is optional. Arepas not areas lol oh corrective spelling why do you torture me! 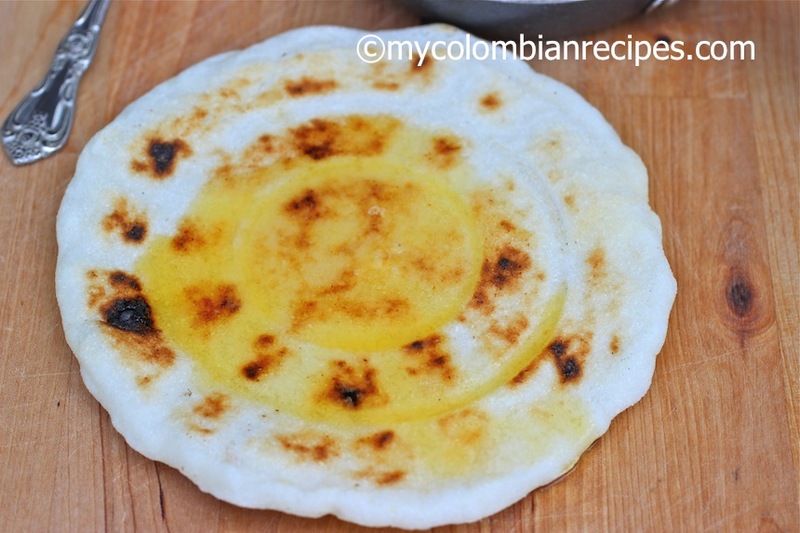 Can you use masa harina to make arepas? Do you have to cook it beforehand? 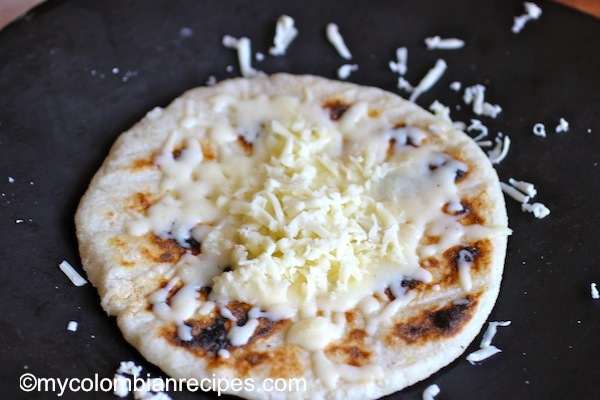 My boyfriend is Ecuadorean, not Colombian, but both countries eat arepas and I would love to surprise him with some…! Amanda, For Colombian arepas you have to use masarepa or pre-cooked cornmeal. They sell different brands Goya, Harina Pan…..You can find it online at amazon.com or at your local Latin market. I can’t wait to try some of these recipes for my boyfriend! His father was Colombian (passed away), and he grew up with his Canadian mother making him Colombian foods, supposedly she was excellent at it, but I’d love to learn from a real Colombian woman as well! He lived in Colombia every year for 3 months until he was 18. 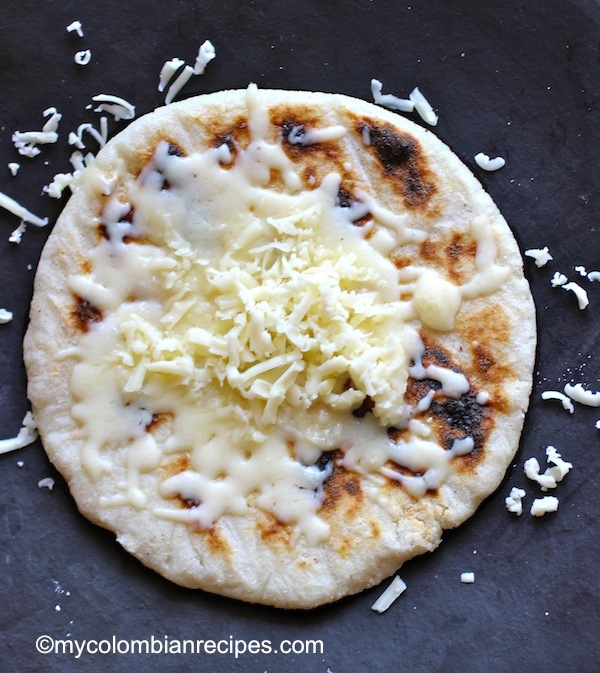 He always talks about Arepas, and I have never had them, but I really want to try them! This recipe looks pretty simple. Not sure what I would use here in Canada for the pre-cooked cornmeal, since we do not have many latin american food stores…. hopefully I can find a good substitute! Dios mio, estas arepas salieron deliciosas!! gracias por la receta, la hice ayer y nos encanto. Me encanto que la masa quedo siempre suavecita y no se seco!! Una pregunta, usted ha echo alguna receta de carne en palito? me recuerdo que en las called de Maicao – La Guajira, vendian carne en palito con papitas chiquitas. Super deliciosas! I tried making these this morning and I thought they were delicious! However my boyfriend pointed out that in Colombia the arepas tend to be a little bit more “hard.” The ones I made were pretty soft..they folded easily and there wasn’t much “resistance” to them when you bit into them. I thought I followed the recipe to the letter – do you have any idea what I might have done wrong? I used fresh mozzarella – could that be the issue? Or did I just not cook them long enough? Next time…don’t use fresh mozzarella and cook them longer. 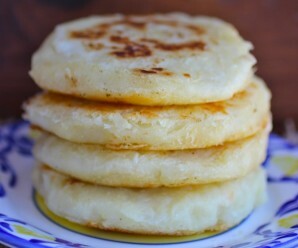 Arepas made with masarepa are softer the arepas made with corn. I’m going on holiday to Switzerland soon and I’d like to know if you can make these with Swiss cheese too? I would like to know what is the procedure of freezing the arepas? Do you freeze them raw or cooked? How can you heat them up after? Greetings. I know this is an older post, but I had to add my ‘thank you’. Made these this past week end for the first time. Delicious. Especially with sausage gravy! I tried them this week for the first time, with the Pork, Mushrooms and Avocado Sauce on this wonderful site. So easy to make and the taste was awesome. I was lucky enough to find arepa flour at my local Safeway. I look forward to trying some of your other dishes that are served with them. Thank you Erica for sharing your wonderful food with us. If you are in Australia I found this South African product which works just as well; Protea maize meal. I found it at a particular woolies, but check South African specialty stores too. If you are in Brisbane, go to penissi in the gaba to get PAN and lots of other Colombian items like triguisar and panela. Maria, las puedes medio cocinar (no totalmente) y luego las pones en una bolsa con cierre y las puedes poner en el congelador. Erica, my husband and I have fallen in love with arepas, thanks to your recipe! I have especially found it helpful because I am gluten-intolerant, but corn is A-OK, so this is a great bread sub for me. Do you have any tips or tricks for prepping in advance or speeding up the process, or do you just make them fresh from square one every time. By the way, would you happen to know how to make ceviche? Lo que le explico arriba a Maria, seria eso lo que hace Ud. para facilitar el proceso? I usually make a large batch and cook them for about 60 seconds on each side. Let them cool and place them in the freezer in zip lock bags.Every time you want one, just take it out of the freezer and cook it until is done. I love Colombian food and your recipes are so amazing! Great job writing this blog! 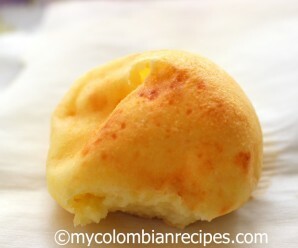 These arepas de queso are very simple to make . I make them every day. I finally made arepas for the first time. I am, um, in my 40s! Mi mama will be so proud of me! Multi-cultural day (at kid’s grammer school) here we come! Thank you for the recipe. Easy and delicioso! I was referred by a friend to your site. Love your recipes! I just now subscribed via email. Help. What did I do wrong? My arepas came out very tough and not “airy” in the middle. The only thing I did different was I had to walk away from my dough for about 15 minutes. I just met the nicest Colombian man at church and I look forward to trying this recipe so next week at Mass I can bring him a surprise! I am hoping the way to mans heart is thru his stomach so I want to make sure I make Oscar something I know he will like! Your site has been amazing for me! Thank you so much! I’m curious what I’ve done wrong. This is my first time making arepas, or any kind of Columbian food. It seems so simple, but as I am cooking them they are just falling apart. The dough sticks well enough to itself, but once it begins to cook and I have to go to flip them they just crumble into a mess. Still delicious, but not arepas. No “U” por favor lol “COLOMBIAN..
Common mistake …. sounds like either too much water … type of cheese maybe to fresh. Love this Blog… for 14 yrs spent about a 1-2 months per year in Cali. Fell in love with the people and Culture . Ugh!!! LOPEZ …lol see what I mean!!! Hockey Pucks from Antioquia? no thanks; get the Real Arepas The Size of a dinner plate from the region of the state of Cesar and Norte de Santander,Colombia: Please!!!! !